February 11, 2019 is Facebook's 15th birthday. 15 influencers weigh in. 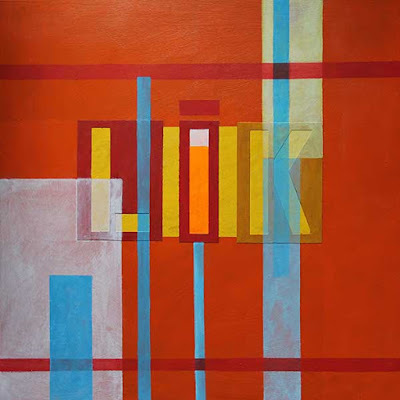 "LIK" as the urban slang or textionary version of "like", done in orange and Day-Glo for a synesthetic effect, evincing "flavors" and "fragrances" of citrus, strawberry, and blueberry. I wanted to make something that was redolent of orange and vanilla ice cream, like a Dreamsicle. (The study for the piece incorporates a popsicle stick.) The piece uses a graphic design approach, focusing on "layout" and using paint color swatches for the color palette. The work also has its own Facebook page. "Likes" are in many cases "applauding": a Like as a click is not the same as a Like as an expression of liking a particular kind of music. It has many shades of meaning: Like is a "tone word" in some sense, where the inflection changes the meaning. I find myself liking things as a way to applaud them, which is undeniably a good kind of Like. But in retrospect, I feel my free will of liking has been suppressed. The "me" of twenty years ago wouldn't have "liked" it, yet it would have "clapped." "Clap" is a word that needs the sound that represents, and is louder than an almost inaudible mouse click. This work is for sale. Please contact me to make an offer.